IMPORTANT !! on 25.4.2013 this Indoor Playground got BURNED DOWN due to electric isolation failure. For now they are CLOSED. I believe they will re-open eventually, but we do not know when. 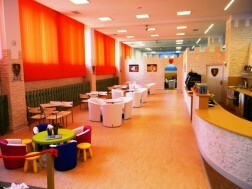 Newly opened is a spacious Indoor Playground on Letna called Detsky Svet (Kid’s World). So we were walking in Letna Park and it started raining, standing on the stairs to the Museum of Agriculture (next to the Technical Museum) we noticed a poster advertising an Indoor Playground within the premises. Then I remembered someone had mentioned a new Indoor Playground in this area and low and behold the rain brought us to it! 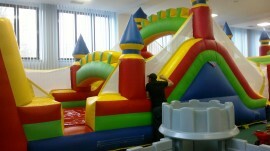 I don’t know any Indoor Playground, with the exception of Beckiland, that has such a big Bouncy Castle. It dominates the whole place! We walked in and there were at least 5 foreign families with kids so the word had already spread. No wonder. What a great combination it is. Letna Park with the outdoor playgrounds and a big, clean Indoor Playground right next to it. The clever managers opened it just before the winter season when parents are desperate for indoor activities. This Playground doesn’t offer Babysitting, you have to spend time here with your kids and it’s your responsibility when they climb on to the Bouncy Castle. You can comfortably sit at the tables and have coffee - yet the capacity of tables is limited. We managed to get the last table here. 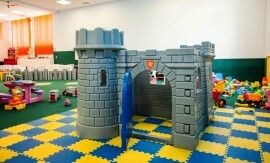 You can still enter with your child but you will have to sit on the carpet in the play area. Or - there are some more tables in front of the reception - but you wont be able to see your child. The entrance fee is for the whole day. If you come in the morning and pay then go for lunch and come back you will be let in without having to pay again - you just need to keep the receipt. You can buy some baby food (Hipp and some Czech brand) and snacks. They do not cook so don’t rely on having lunch here. I saw a mini glass fridge counter ready to host some sandwiches and finger food but maybe this is a plan for the future. Treat it as a cafe with kids treats. What I didn’t know is that you can go to the courtyard of the Museum of Agriculture and experience a mini ZOO. I learned this from their website and I am sorry we didn’t see it with our boys. Apparently kids can pet live sheep, rabbits, cats, pigeons and hens. 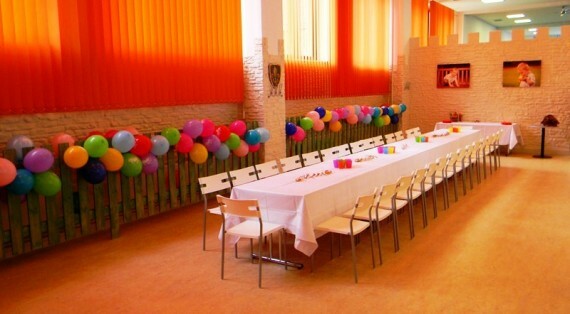 I love the way the space is bright and full of sunlight, it’s a very positive environment for Kids Birthday Parties. I spoke with the manager and they are still learning how to do things best. Bigger groups have their birthday tables right next to the Indoor Playground. You can also choose a space in front of the reception but it will be a bit too far away from the Playground. 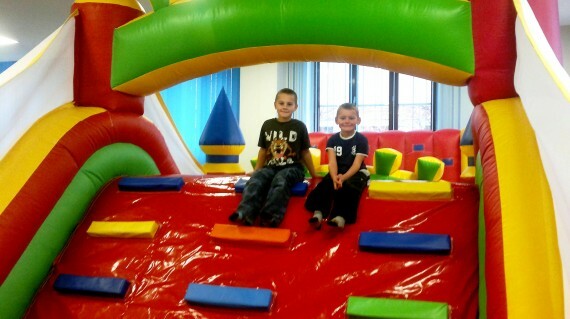 I was told that they will arrange more space for Birthday parties within the Indoor Playground area itself. 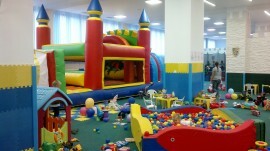 I asked about the cost for a birthday party but they do not have any packages or fixed offers like other Indoor Playgrounds. 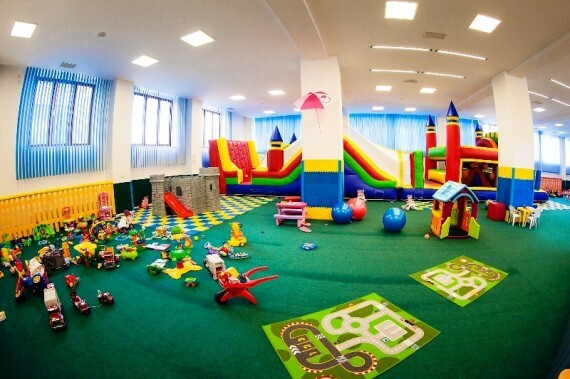 The basic idea is that they charge around 200czk per child including: decoration, decorated birthday table, cold refreshments, kids champagne and entrance to the Playground. If a bigger group is coming they will provide not only finger food but also cold platters. The manager explained to me that they calculate everything individually according to the clients wishes. They allow kids only up to the age of 7 years. I asked what if a family with 2 kids comes in and one is 3 and the other 8. Dont worry - they will not send you away. Yet again - older kids may be turned down.